Over the river and through the woods was how you got to grandmother’s house. Nothing about train tracks to get to her house though. 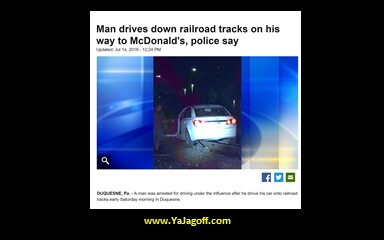 But this driver thought McDonald’s might have drive-thru windows for box car passengers along the railroad tracks I guess. He’s kinda like the ultimate line cutter .. (when people get outta line at the drive thru, go in and get an order to go because it’s faster than the drive thru!) He’s like screw the real drive thru.. I’ll get the late night TRAIN window! With this story, there are more questions than answers. Here’s the original story on WPXI.com. Is this the perfect promotional advertisement McD’s UberEats? Is this the new high-efficiency-clown-subway-car that actually fits 39 passengers after vacu-packing them? in those clothes bags? But, the ULTIMATE question is, how far toes one have to travel on railroad tracks before they realize that they are actually ON railroad tracks? HINT: about 2 feet! The big bump going over the rail that made your molars clang together and probably made ya pass a little gas combined with the rattling of your teeth as you passed over all of those railroad ties might have been a clue that something was just not quite right, YaJagoff!